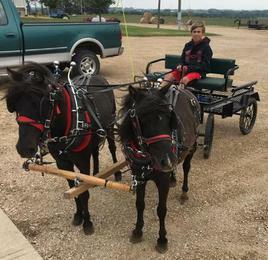 IF YOU ARE A DRAFT HORSE CONSIGNOR THAT DID NOT MAKE THE CATALOG YOU HAVE THE OPTION TO SELL YOUR DRAFT HORSE AFTER THE CATALOGED HORSES ON THURSDAY INSTEAD OF WAITING UNTIL FRIDAY. and Friday horses until Noon March 29. LOT 178 - Stella, a grade Percheron/Haflinger cross filly foaled April 9, 2018. Good sized and friendly. LOT 179 - Lucky, a grade Percheron/Norwegian Fjord cross gelding foaled April 20, 2018. Good sized and friendly. Lot 180 - Bambi, a grade Percheron/Norwegian Fjord cross filly foaled May 5, 2018. Good sized and friendly. Lot 181 - Jamie, a grade Percheron/Haflinger cross gelding foaled May 8, 2018. Good sized and friendly. Lot 183 - Mable, a grade black Percheron-Belgian-Saddlebred cross mare with star. Foaled May 4, 2018. Halter broke. Lot 589 - A dark grey grade 6 year old Pony gelding with light mane and tail. Stands approx 38". Broke to ride and drive single. Stands approx 14 hands, Will have 30 days of ground work and riding on her by sale day. Lots 591 & 592 - Jill & Jack, a team of grade 8 & 9 year old pure white Pony mare and gelding. Stand approx 50". Broke to drive and ride. Drive single, but drive better double. Been in parades, in town, and up and down the road. Traffic broke. Lot 595 - Sugar Cane(Pictured left), a grade 7 year old Welsh Pony gelding. Stands approx 50". Drives single and double. Also rides. Home raised. Sired by registered Welsh Rocking H Bailey. Lot 596 - Ranger(Pictured right), a grade 1/2 Welsh gelding. Stands approx 14 hands. Home raised. Drives single and double. Started under saddle. Lot 597 - Jetson(Pictured left), a grade 4 year old Pinto stallion. Stands approx 14 hands. Very easy going. Drives single and started under saddle. 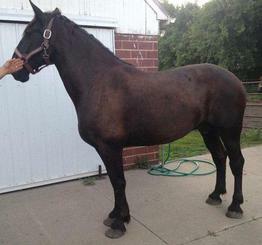 Lot 598 - Travis, a grade black 10 year old Percheron/Quarterhorse crossbred gelding. Stands approx 15 hands. Kid broke. Been on the top buggy for lots of miles. Nothing bothers him. Lot 184 - Ron, a grade red sorrel Belgian yearling stallion colt with a strip, 2 white socks, flaxen mane & tail. A nice yearling colt with a long tail. Lot 185 - Louie, a very dark brown grade 2018 Shire/Percheron cross stallion colt with 3 white stockings and blaze from forehead down over his nose. Will probably shed off black. Halter broke. Lot 186 - Misty, a grade very dark brown, almost black 2018 Shire/Percheron cross filly with 4 white stockings and wide blaze from forehead down over her nose and left cheek. Halter broke. Lot 187 - Molly, a 2018 grade light bay Shire/Percheron cross filly with 4 white socks, blaze from forehead down over her nose, black mane and tail. Halter broke. A very nice colt. Lot 188 - Babe, a grade 2017 dark bay 3/4 Percheron / 1/4 Belgian filly with white star on forehead and all black feet. Halter broke as a yearling. Is nice and quiet, easy to work with. Would make a good work horse. Lot 599 - Buckshot, a grade 8 year old buckskin Pony gelding with a star. Stands approx 52". Broke to drive double. Traffic broke. 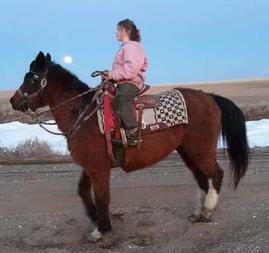 Lot 600 - Patches, a 9 year old grade brown & white Shetland-Paint cross mare. Stands approx 39". Drives double and also rides. Traffic broke. Lot 189 - Boss, a 4 year old grade black Percheron gelding with star. Stands approx 18.1 hands. Drives single, double, and on either side. He has been used on the farm, on the highway, and is traffic broke. Has a good personality and likes attention. Lot 191 - Bell, a 3 year old grade bay Clydesdale cross mare with strip and 4 white socks. Stands approx 16.2 hands. Will have 60 days of driving and riding by sale day. She is a real sharp mare. Lot 190 - Bill, a grade 3 year old bay Clydesdale cross gelding with strip and 4 white socks. Stands approx 16.2 hands. Will have 60 days of driving and riding by sale day. He is a really stout built horse. Lot 192 - King, a 3 year old grade black and white Spotted Draft crossbred gelding. Stands approx 15.3 hands. Will have 60 days of driving and riding by sale day. He is real quiet and gentle. 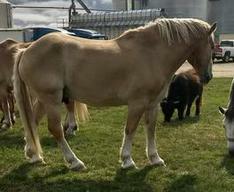 Lots 193 & 194 - Cody & Colby(Pictured left & right), a team of grade 10 & 11 year old Belgian geldings. Stand approx 17.3 hands. Broke-broke-broke. Anyone can drive them. Been on wagon trains, hayrides, have done weddings, been used on the far. Nice quiet team. Lot 195 - A blonde grade yearling Belgian stallion colt with stripe, light mane and tail. Lot 196 - Bob, a 2 year old grade red sorrel Belgian gelding with strip, flaxen mane and tail. Halter broke and would make a nice farm horse. Papers available at buyer's expense. Lot 601 - A black grade 15 year old Tennessee Walker mare. Stands approx 15.3 hands. Has been used for trail riding and breeding mostly. She was halter shown as a young horse. Has been bred for mules and other Tennessee Walkers. Stands approx 15.2 hands. Big bodied, easy to trim and shoe, very mild tempered, beautiful mare that has been trail rode and has a soft eye. A very easy keeper! One that will take care of you all day with the same easy temperament. Stands approx 15 hands. Foundation bred with the great Howard Pitzer Two Eyed Jack and Fiddle on Jack on papers. Trail rode and has had several foals. Lots 197 & 198 - Jay & Prince, a team of grade light bay & red roan 21 & 22 year old Belgian geldings. Stand approx 16.2 hands. Have teamed for years and have a lot of fire to them yet. Broke to farm machinery. Have hauled wood with them. Lots 604 & 605 - Sonny & Cher, a team of grade 8 year old sorrel & white Quarterhorse cross gelding & mare. Stand approx 15 hands. Drive down the road with traffic or good riders. Been on trails and around cattle. Good with farrier. They must stay together-they get separation anxiety when one goes out and not the other. Lot 199 - Jake, a grade 8 year old roan Belgian gelding. Stands approx. 16.3 hands. Broke to all farm machinery, has been used in the woods. Very good puller, breeding - C.D. Rex. Lot 200 - Pete, a grade 8 year old roan Belgian gelding. Stands approx. 18.1 hands. Very good worker, no problems with him. He hitches with any horse. A good tough horse. Lot 201 & 202 - Pictured above. 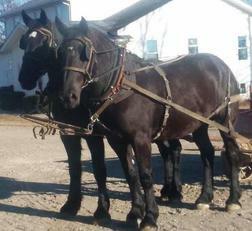 A team of registered 4 year old black Percheron mares. Stand approx. 17 & 17.1 hands. Half sisters sired by Double Y Extreme. They drive single, double, and on either side. Traffic broke and have been on most farm machinery. This is a nice, quiet, gentle team that is not spooky. Very people friendly, and also ride. One mare is bred to a Centerview Eclipse stallion for an April colt. 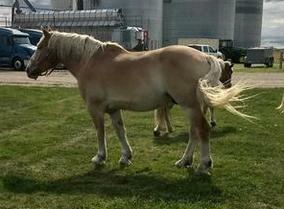 Lots 205 & 206 - Willie & Weiner, a grade team of blonde Haflinger geldings with strips. Stand approx. 14.1 hands. Broke to drive double and also ride. Traffic broke. Lots 203 & 204 - Rowdy & Randy, a team of 3 & 4 year old grade black Haflinger-Friesian-Morgan cross geldings. Stand approx. 14.1 hands. Broke to ride and drive single and double. Quiet and gentle to be around on the highway and in town. Sharp, sharp team! Lot 606 - Jerry, a grade 16 year old bay Standardbred gelding. Stands approx. 16 hands. Broke very good - traffic broke. A good hobby horse. Lot 608 - A grade black 1/4 Dutch Harness - 3/4 Standardbred yearling stallion colt. Stands approx. 13.2 hands. Very nice moving colt, good looking, sound in every way. Halter broke, a good prospect. Stands approx. 15 hands. She has great conformation and a wonderful disposition. Extremely easy to be around and handle. Has been used to trail ride. Rides out alone or with a group. Crosses water, ditches, and goes where you point her. Pictures and videos at tietjenperformancehorses.com. She has been trail rode and used for 4H. Very ease to be around and handle. Stands approx. 55". 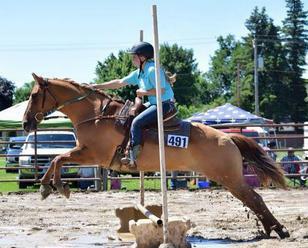 Extensive training for showmanship, trail, western pleasure, western equitation, reining. Used for POA sanction shows, 4-H, and county shows. Very flashy and pretty gelding. Easy to catch, tack, clip, and farrier work. Lot 612 - Justice, a registered brown & white Pinto gelding over 10 years old. Broke to lead and for adults to ride. Lot 613 - Jill, a grade 4 year old brown & white Paint Pony mare. Stands approx. 45". Open. Broke to drive. Lot 616 - Katie, a grade 4 year old brown & white Paint Pony mare. Stands approx. 45". Open. Broke to drive. Lot 619 - Whitey, a 12 or 14 year old grade pure white Pony mare. Stands approx. 45:. Open. Broke to drive. Lots 209 & 210 - Paul & Julie, a grade team of black teenage Percheron gelding & mare. Stand approx. 16.2 hands. Mare is open. Broke to all farm machinery. 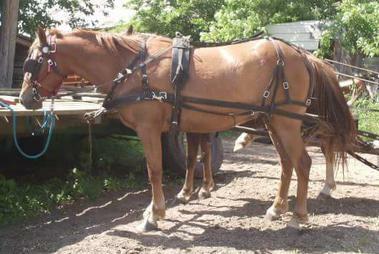 Used for hay and sleigh rides. Very quiet team. Lots 207 & 208- Kim & Kate, a grade team of 6 & 7 year old black Percheron cross mares, one has a star. Stand approx. 16.1 & 16.2 hands. Broke to drive single and double and on either side. Broke to all farm machinery. Easy keepers. Lot 615 - A Lady to Watch aka: Lady, a registered 8 year old sorrel Quarterhorse mare. Stands approx. 15.0 hands. Open. Broke to ride. A good trail riding horse and is traffic broke. She crosses water, logs and the teeter totter. When you call her name, she will come right up to you. Easy to catch and loads good. Lots 211 & 212 - A grade team of 2 year old sorrel Belgian mares. Stand approx. 15.3 hands. Nice young pair, halter broke. Lots 593 & 594 - Minnie & Mickey(Pictured right), a grade team of 7 & 8 year old black Pony mare & gelding. Mickey & Minnie are broke to drive single, double and are traffic broke. They have been used as a team, 4up and 4 abreast. We have used them for weddings and parades. Very quiet and very well broke. Lot 215 - Cody, a blonde yearling Belgian stallion colt with a star. Halter broke. Lot 182 - Lola's Flirtaton(Pictured left), a black 12 year old registered Percheron mare. Stands approx. 17 hands. Open. Green broke. Started in harness. Sired by Blue Ribbon Farms Prince, out of Lola's Cricket. Lot 218 - A grade 4 year old grullo Fjord/Haflinger cross mare. Broke to ride and drive single and double. Traffic broke. Lot 216 - Sally, a grade buckskin yearling Belgian/Percheron cross mare with a star, black mane & tail. Halter broke. Lot 217 - Max, a grade 5 year old black Percheron gelding. Stands approx. 17.3 hands. Green broke. Started well to drive single and double. Lot 617 - Curly(Pictured right), a grade 15 year old bay Curly mare. Stands 13 to 14 hands. Well broke, as my 8 year old daughter has been riding her, and riding her around cattle. Previous owner's grandson rode this horse. Traffic broke. A nice quiet well broke horse. Lot 620 - Romandaros Eqyptian Kings Dawn 230355A, a registered blue roan Miniature mare. Stands approx. 31.5". Foaled March 28, 1994. In foal to a 30" blue roan Miniature stallion. Lot 621 - Tjeerdsma's Gold Melody 273269A, a registered buckskin Miniature mare. Stands approx. 30.5". Foaled April 10, 2006. 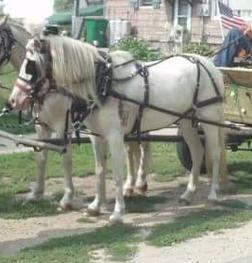 In foal to a 30" blue roan Miniature stallion. Lot 622 - R. Bears Farms Golden Honey 284972A, a registered buckskin Miniature mare. Stands approx. 30". Foaled May 16, 2007. In foal to a 30" blue roan Miniature stallion. Lot 623 - Lil Blue Ajalon 334174T, a registered blue roan Miniature mare. Stands approx. 30.5". Foaled June 8, 2013. In foal to a 30" blue roan Miniature stallion. Lot 624 - Lil Bit of Spice and Sugar 320228T, a registered cremello Miniature mare. Stands approx. 33". Foaled May 7, 2012. In foal to a 30" Miniature stallion. Lot 625 - Lil Bit of Misty Echo 332388T, a registered buckskin Miniature mare. Stands approx. 30". Foaled April 29, 2015. In foal to a 30" Miniature stallion. Lot 626 - Wild Women's Mystery Phantom 301272A, a registered gruella Miniature stallion. Stands approx. 38". Foaled June 19, 2009. Well broke to drive. Lot 627 - Knight, a red roan Miniature stallion. Stands approx. 32". Foaled May 1, 2017. Registration pending. Lot 628 - Maple Hollow Dark and Dangerous 340719T, a registered black Miniature stallion. Stands approx. 32.5". Foaled April 28, 2017. Halter broke. Lot 629 - Kings Poco, a cremello Miniature stallion. Stands approx. 28.5". Foaled July 10, 2018. Registration pending. Lot 630 - Honey's Mahlon, a gruella Miniature stallion. Stands approx. 30". Foaled May 19, 2018. Registration pending. Lot 631 - Lil Bit of Pepper, a sorrel Miniature mare. Stands approx. 30". Foaled May 19, 2018. Registration pending. Lot 632 - Lil Peanut, a grade 2 year old gruella Miniature mare. Stands approx. 27". Lot 633 - Lite Star, a cremelo Miniature stallion. Stands approx. 28". Foaed June 15, 2018. Registration pending. Stands approx. 14.3 hands. Head/heel horse most of her life. High energy all work horse very responsive with all the buttons, very willing & eager to please, trails, loads, bathes, clips, shots, deworm all easy. Mild confirmed on x-ray 2 yrs ago arthiritis right front but daily work does not bother it; but was sore on day 3 at a barrel race 2 yrs ago so I have stopped running barrels with her. Lot 219 - A grade black 2 year old Percheron-Belgian Pulling Bred cross stallion colt. Halter broke.